Drone Footage from Easy Divers in Cyprus. Drone video of dive sites in cyprus. Holiday Life is all about family. For scuba divers, there are few things more enjoyable than watching the blush of discovery light up the face of a son or daughter upon seeing their first sea lion, turtle, moray eel or starfish in their natural habitat. Easy Divers Cyprus caters for all shapes and sizes of people who would like to take their first dives underwater. Children are specially catered for with our small size range of kids diving equipment specifically for their size. For kids to be able to fully enjoy these life-altering sea diving experiences, they must be properly kitted out with safe with dependable dive equipment and snorkel gear. This doesn’t mean simply strapping them into an extra-small adult BCD (Buoyancy Control Device), or padding the foot pocket of a full-sized diving fins to accommodate their tiny feet. On the contrary, to be completely comfortable, safe and happy in the water, kids need gear that’s been built specifically for them, gear they can truly call their own. 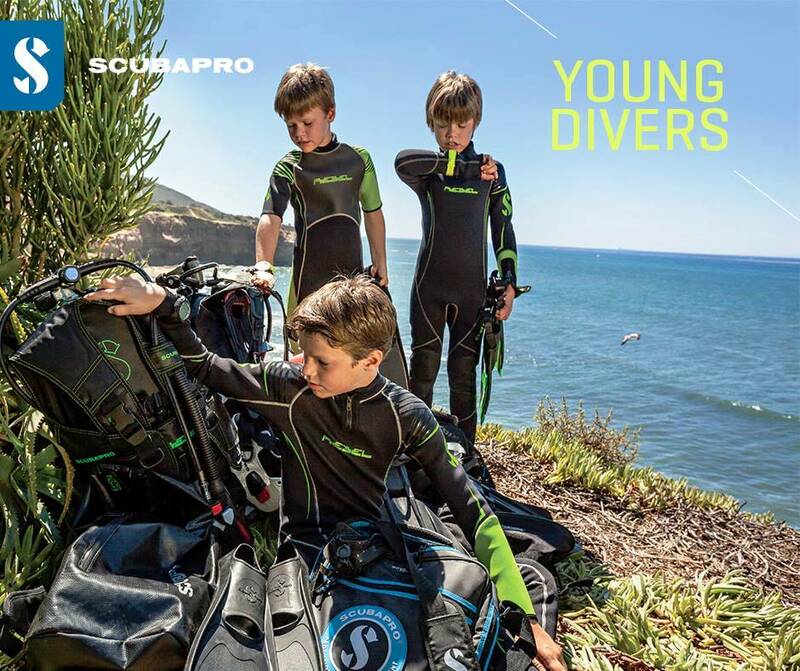 SCUBAPRO Diving Equipment offers a complete line of snorkeling and diving equipment for adults and kids diving equipment. This scuba gear is made from the best quality materials and produced according to all legal european and local requirements. But most importantly, this gear has been specially designed to address the unique fit and performance needs of children. At Easy Divers Cyprus wh a a full range of snorkelling and diving equipment specifically for children. Our equipment like scuba diving regulators feature smaller mouthpieces and shorter hoses as well as compact first stage regulators and lightweight second stages. BCDs offer a wide range of adjustment that can expand as the child grows, plus the inflator hose is shorter and there’s the option of adding an integrated weight system. Kids wetsuits are built with X-Foam neoprene, which is low in harmful materials yet soft and pliable so they are comfortable and easy to put on and take off. Wetsuits also come in child-oriented sizes. SCUBAPRO Masks and Fins are all made to high quality standards. It’s all designed to allow children to be safe and comfortable in the water so they can focus on having fun. We will make sure when you visit Easy Divers Scuba Diving Shop in Protaras, that you are shown only the best snorkeling gear and scuba diving equipment that is available on the market. Easy Divers Cyprus can learn you more about equipment with the PADI Touch. Learn from your phone or tablet, Padi eLearning. 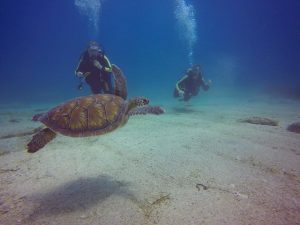 Cyprus Turtles, It’s an amazing experience to come face to face with a sea turtle while diving. With their cute little faces, intricate patterns on their shell and the way they move so gracefully through the water, you’ll find yourself mesmerised, dazzled and wanting more. In the resort of Protaras, Cyprus we have a very particular type of sea turtle that is like the green turtle. It’s Greek name, Caretta-caretta. These are very common at our dive sites in Cyprus. We love to see these when we dive and getting the feeling of how graceful the turtle moves underwater. At Easy Divers in Cyprus, our padi Instructors will show you the places that are almost a guarantee we will see them during the dive. We have to be careful when around the creatures as we don’t want to disturb them while they feed. It spends most of its life in saltwater and estuarine habitats, with females briefly coming ashore to lay eggs. The loggerhead sea turtle has a low reproductive rate; females lay an average of four egg clutches and then become quiescent, producing no eggs for two to three years. Loggerheads spend up to 85% of their day submerged, with males being the more active divers than females. The average duration of dives is 15–30 min, but they can stay submerged for up to four hours. Juvenile loggerheads and adults differ in their swimming methods. A juvenile keeps its forelimbs pressed to the side of its carapace, and propels itself by kicking with its hind limbs. As the juvenile matures, its swimming method is progressively replaced with the adult’s alternating-limb method. They depend entirely on this method of swimming by one year old. 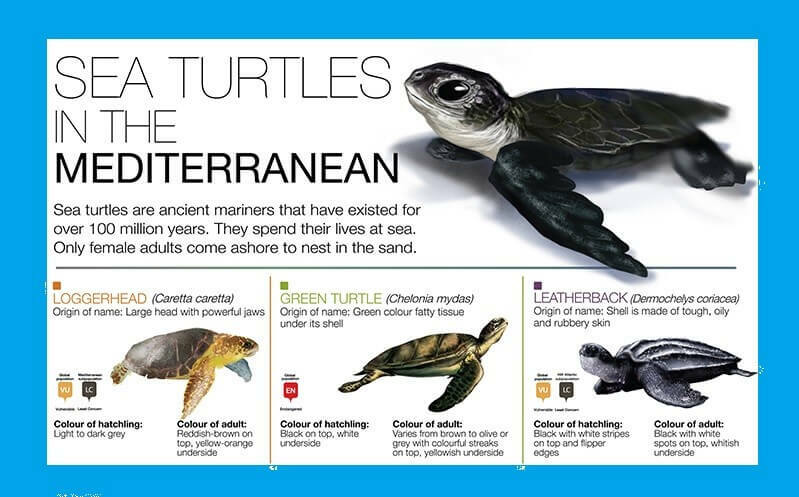 Did you know there are seven species of sea turtle: the green, loggerhead, hawksbill, flatback, Kemp’s ridley, olive ridley and the leatherback, all of which are listed under the Endangered Species List. The sad fact is that their numbers are declining rapidly due to loss of breeding grounds, pollution and human development and we need to work very hard at protecting and preserving these magnificent creatures or they won’t be around for future generations. You might see a couple of distinct species on one dive, so how can you tell the difference between them? The Leatherback Turtle is the largest of the sea turtles reaching up to 1.8 metres (6 foot) in length and weighing over 900 kg’s (2000 pounds). That’s a big turtle! They also have ridges of cartilage along the length of their shell. The Hawksbill Turtle is easy to identify with its mouth that looks like a hawk, hence the name. The Green Turtle has only one pair of scales in front of its eyes compared with the other sea turtles who have two. The Green Turtle is a vegetarian, feeding mainly on seagrass and algae. The Olive Ridleys are identified by their olive coloured shell and the Loggerhead Turtles have a reddish-brown shell and a very large head. These are the most common turtles you’ll see on your dive. With the exception to the green turtle, The rest all enjoy a diet of crabs, molluscs, squid, jellyfish and other soft bodied animals. They have very powerful jaws so passive observation is advised unless you want to lose a finger. Also, it’s best not to disturb the animal, so please do not be tempted to touch them as this can stress out the animal. Sea turtles are usually found near the coast, except for the leatherback, which only comes to the shore for breeding. They can live to be over 100 years old but many die way before their time due to human interaction. Sea turtles are breath holders and must surface every so often for air. Depending on the species and how active they are, they can hold their breath from 1-5 hours. The leatherback has been recorded diving to depths of 1200 metres or more.